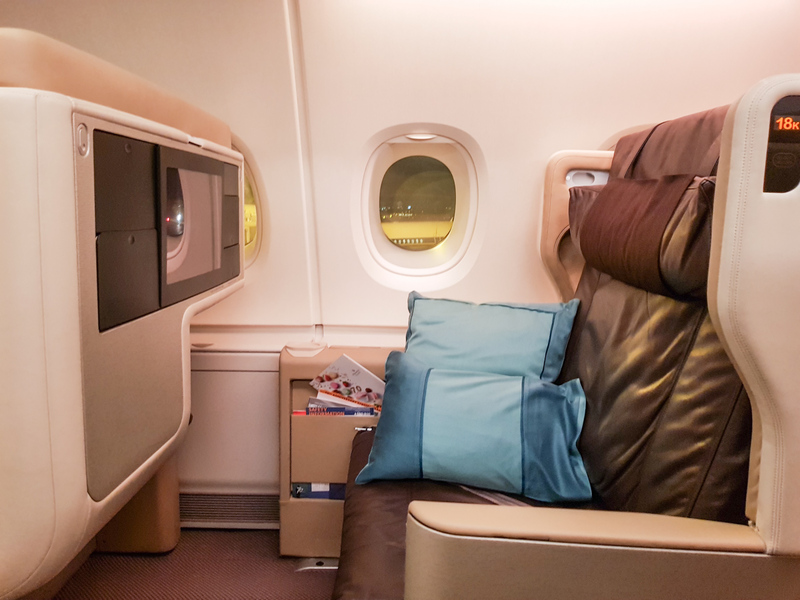 While their Business Class product in the A380 has aged a bit, it is still one of the widest seats you’ll find anywhere, backed up with a solid experience at the airport and onboard. 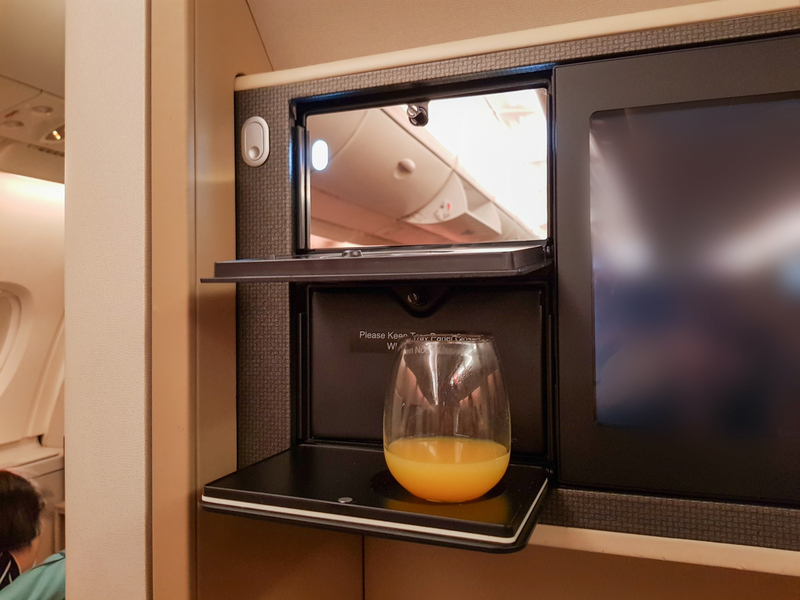 In this overview, we’ll go over what you’ll experience while flying Business Class on the upper deck of their A380s on Australian routes. 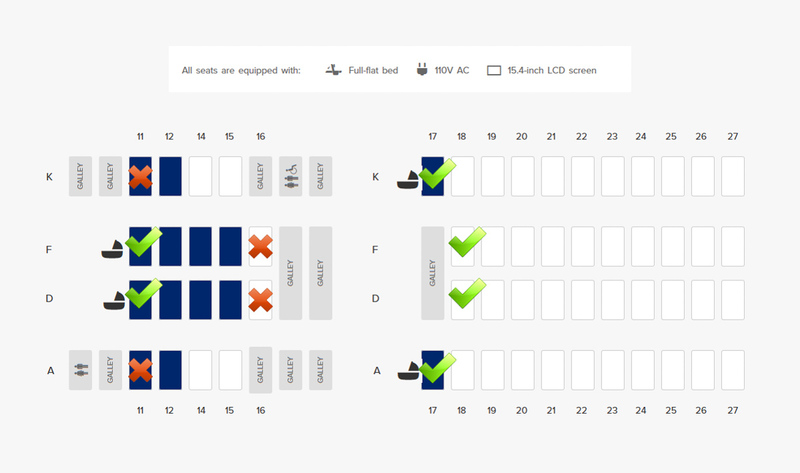 For those of you booked on different aircraft, you’ll find the onboard experience is more or less the same, except the features of your seat will be different (some better, some worse). This product has been progressively undergoing an upgrade since December 2017. 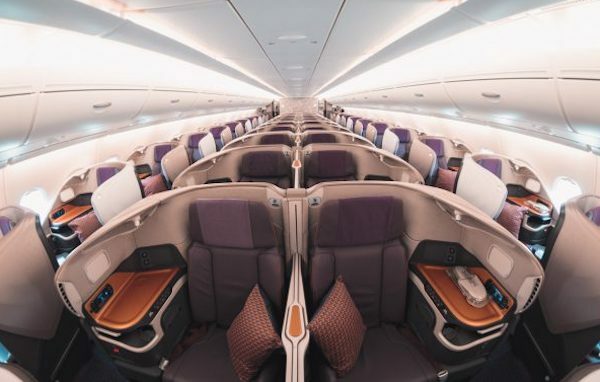 Singapore has also introduced a new regional Business Class product on new Boeing 787-10 Dreamliner aircraft. The cabin is definitely showing its age, having been introduced more than ten years ago. 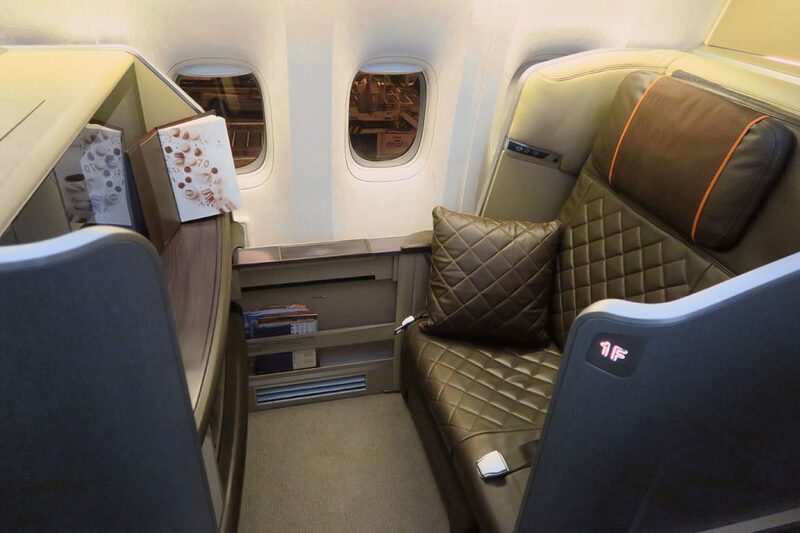 There are two variations with the Singapore Airlines A380 layout. 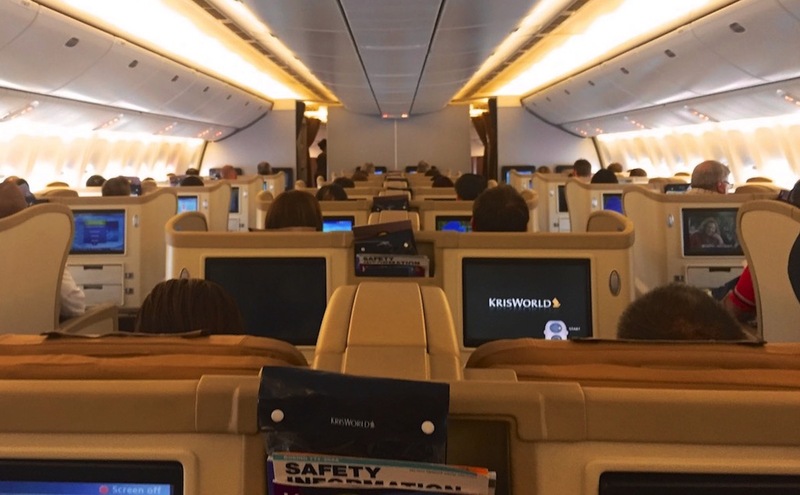 The longer routes with more premium demand tend to see a version that has 86 Business Class seats taking up the whole upper deck. 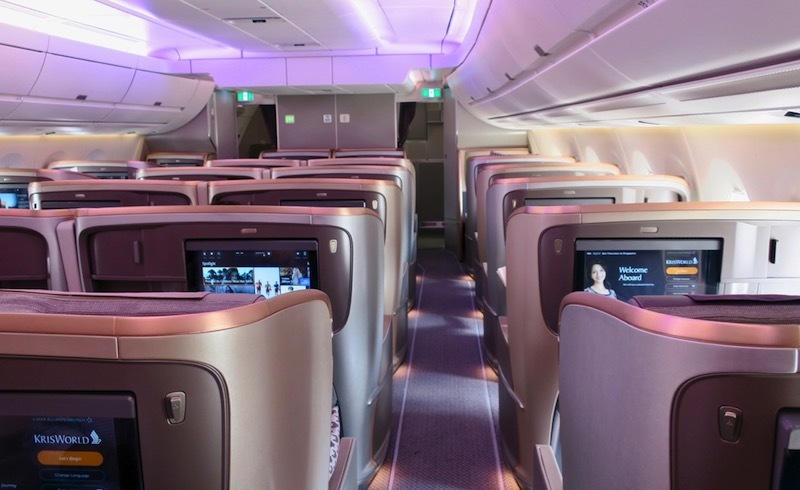 Most other flights, including flights to Sydney and Melbourne, will have the standard configuration with 60 Business Class seats at the front and a small Economy section at the back. This is divided into a smaller forward cabin with 18 seats, and a larger rear cabin with 42 seats (pictured below). But each seat is comfortable at 30 inches wide – enough to seat you and your companion snugly – plus a 55-inch pitch and the ability to convert to a lie-flat bed. There are also two headphone ports (one on each side), so you can watch a movie with your travelling companion, sitting together. Each non-bulkhead seat has a small foot cubby which you can stretch out into, although it also means you’ll be sleeping diagonally across the bed. The seat controls are built into the side. 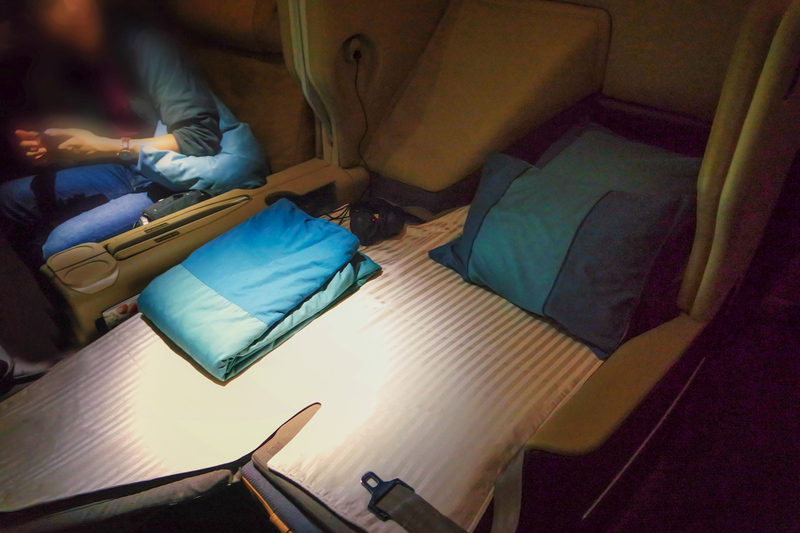 There are some leg rest and recline functions, a reading light, an attendant call button and a do-not-disturb button for when you are sleeping. 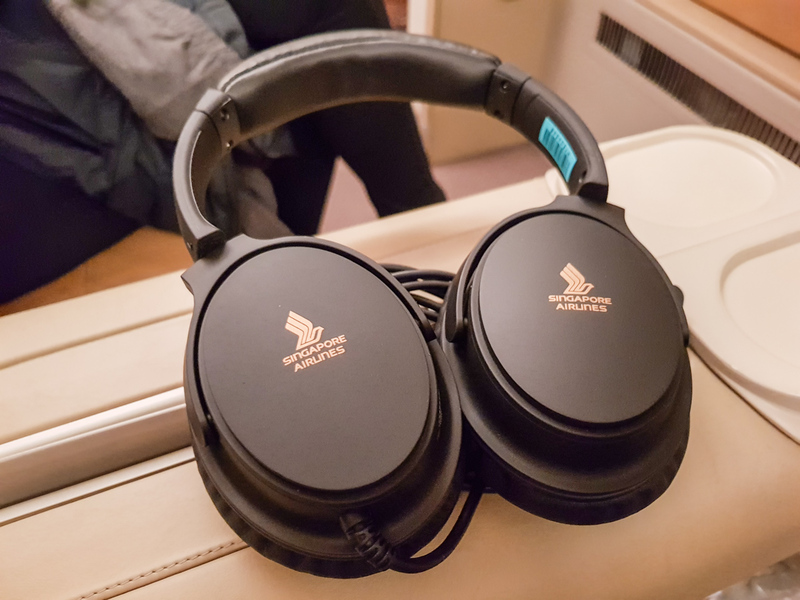 High-quality noise-cancelling headphones are provided. 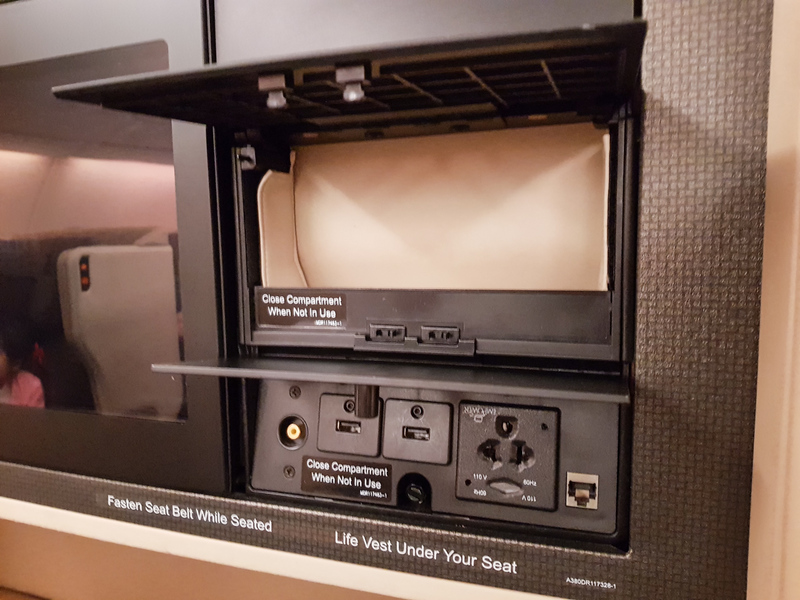 On one side of the entertainment screen is a storage area for your phone and other small devices, as well as a charging port and two USB ports. On the other side of the screen are a vanity mirror and drink tray. 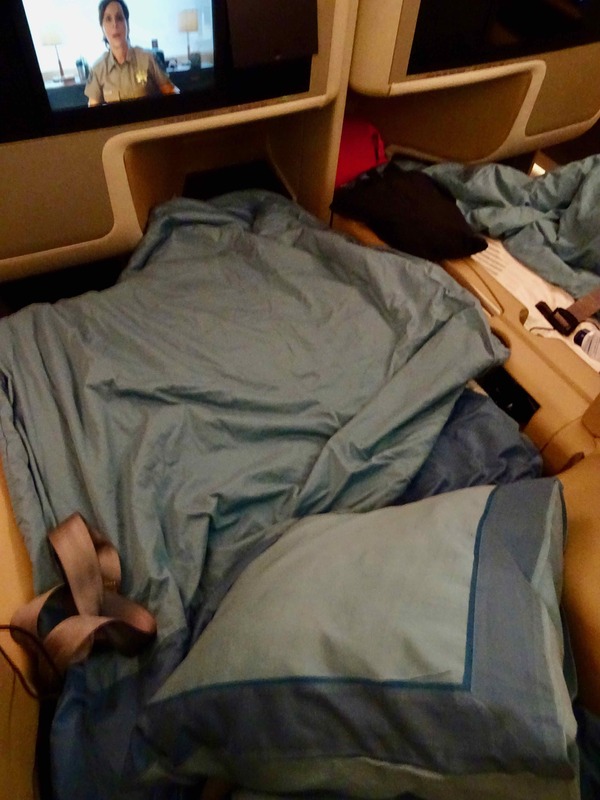 When it is time to snooze, the seat folds forwards, with the bedding and linen hidden behind you in a compartment. 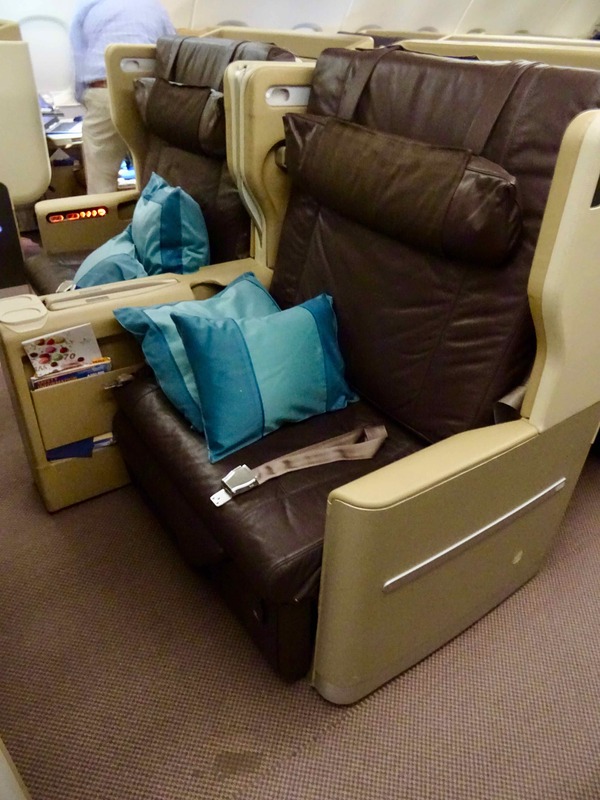 However, since the seat does not recline into a bed, it limits the level of recline you can have when relaxing. 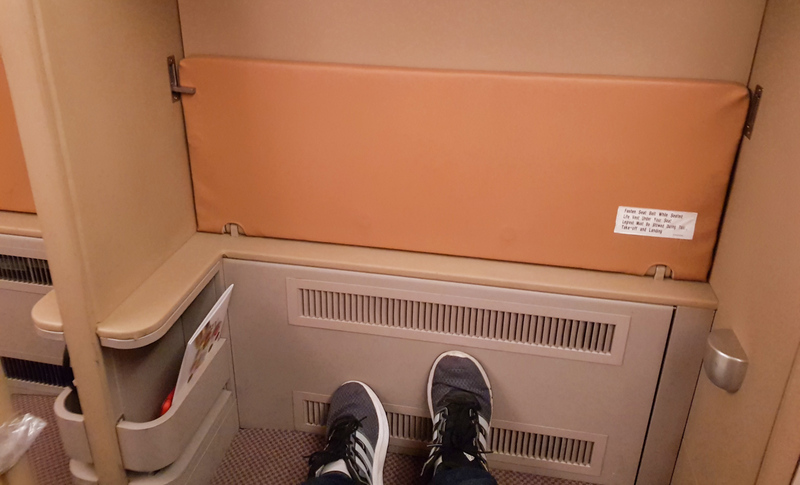 I would recommend a bulkhead seat, as they provide a full-size foot area, rather than a cubby. 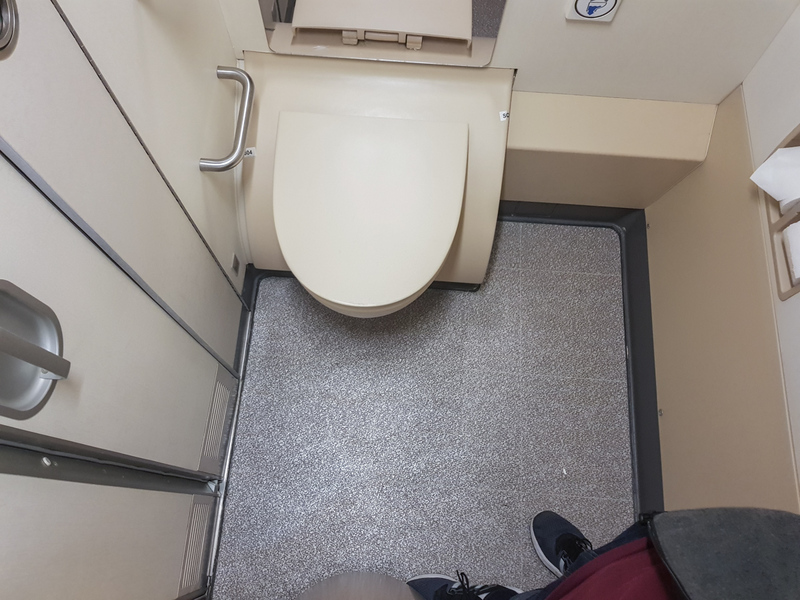 This allows a lot more space to stretch out. The downside of bulkhead seats is that you’ll be near the bassinets, lavatories and galleys, so noise may occasionally be an issue. You’ll also find your personal screen is set higher than other seats, so you’ll be looking slightly up instead of eye level. The rest of the cabin is more or less the same. Situate yourself near the front of your section for quicker meal service, or in the middle for fewer noise disturbances. The forward cabin is also further away from the engines, so ambient noise may be lower. 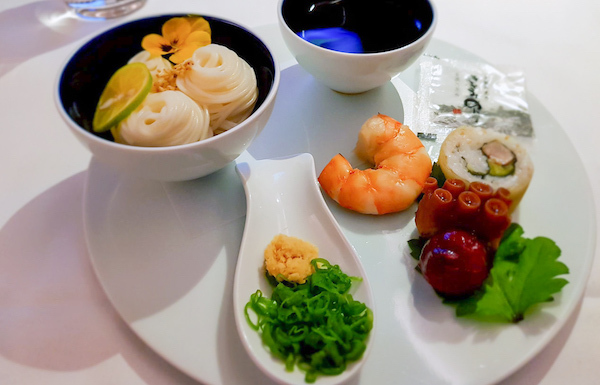 Asian airlines are often known for efficient but impersonal service and my experience on Singapore Airlines matches this. Our cabin crew were polite and did their job well. Your dining experience will depend on the time of day. 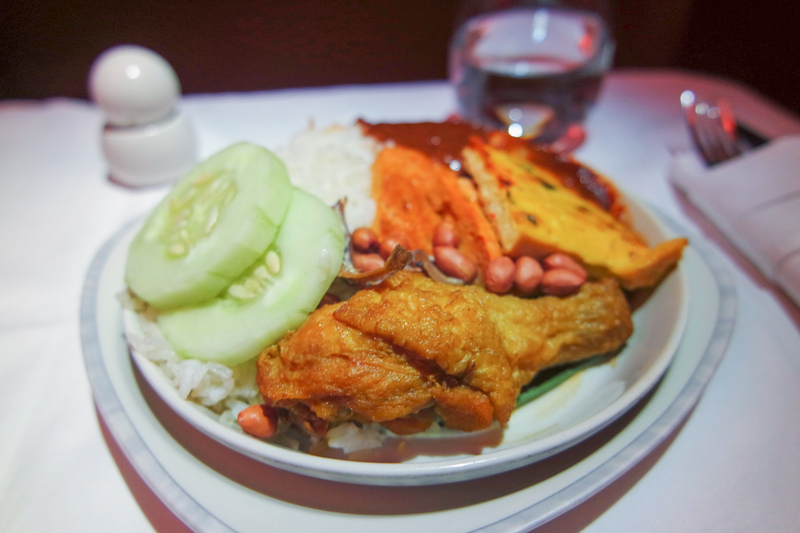 A lunch/dinner flight will have six courses ranging from appetizers to desserts and fruit, while an overnight red-eye flight will have a ‘sleeper service’ menu with supper after take-off and breakfast before landing. 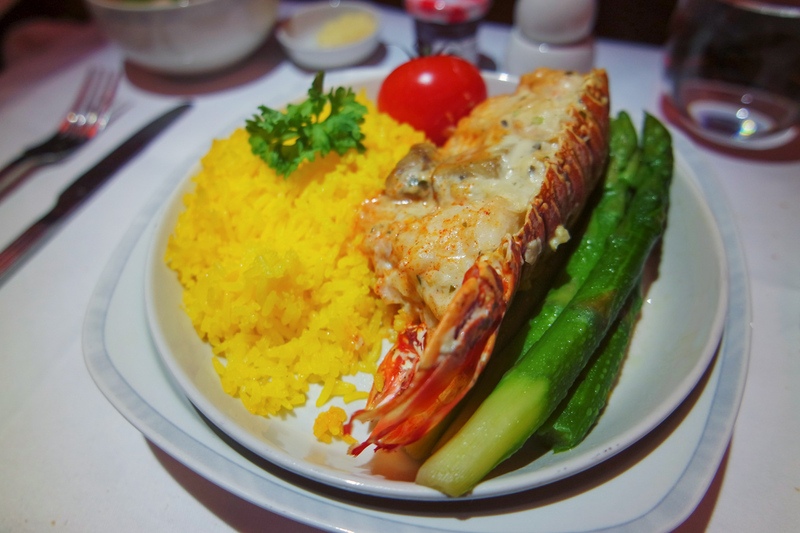 Singapore Airlines also offers premium guests the ability to ‘Book the Cook’ before their flight. 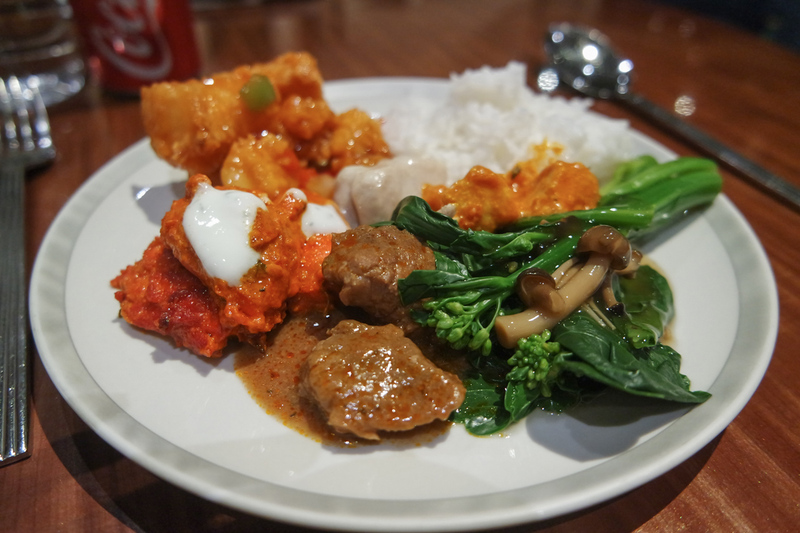 This allows you to pick and choose your favourite meal out of many options. Flights departing Singapore have the biggest range, with more than 50 options. From outstations like Sydney and Melbourne, options will be more limited. 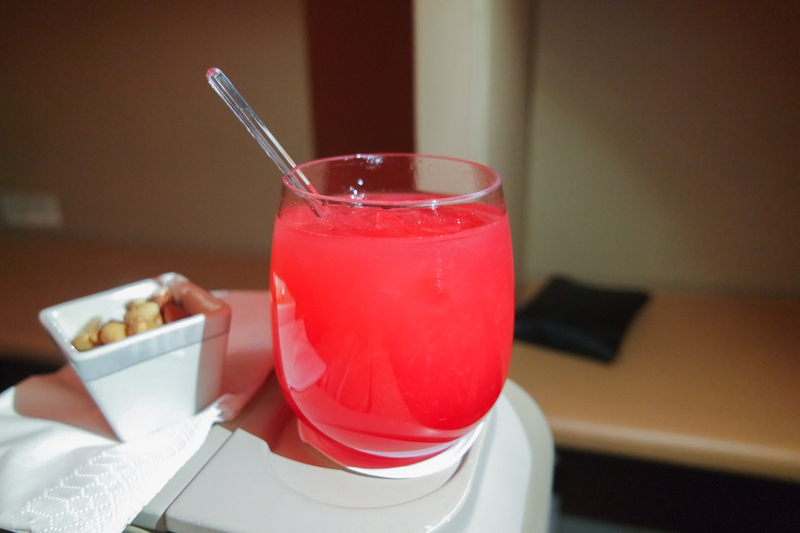 Overall, I find the food and drinks on Singapore Airlines to be of great quality, with an excellent variety of choices. The KrisWorld entertainment system is loaded with a number of movies and TV shows, which you can check during the month of your flight here. We found the interface to be old and clunky (not surprisingly, given it is more than 10 years old) and personally did not find many interesting things to watch. But it is still a perfectly adequate system and the 15-inch screen displayed images clearly. 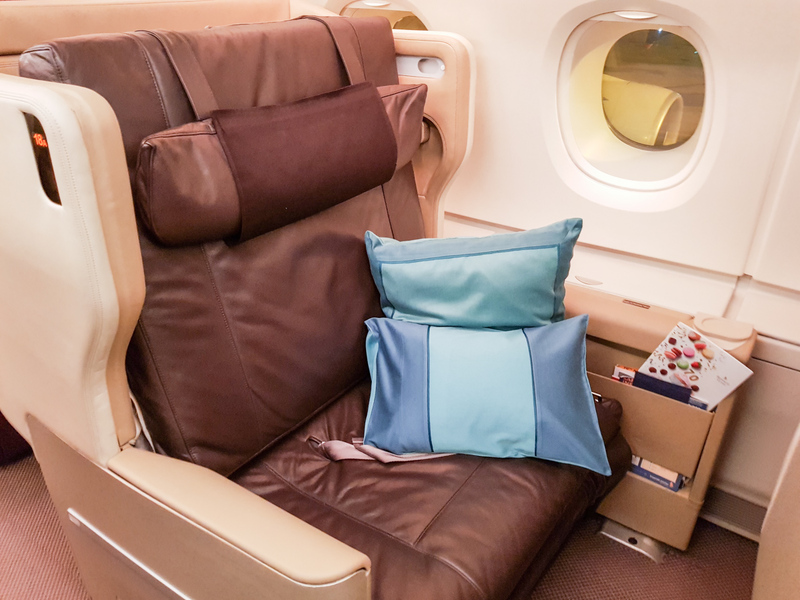 One complaint I have read often is the lack of certain amenities on Singapore Airlines, namely pyjamas and amenity kits. The airline’s reasoning is that it is an unnecessary cost and not everyone would use them anyway, which is fair enough. To commemorate 70 years of Singapore Airlines in 2017, we were pleasantly surprised to receive a limited edition gift pack, containing a really soft eye-mask, hand cream, lip balm and some interesting laundry products for use on the go. 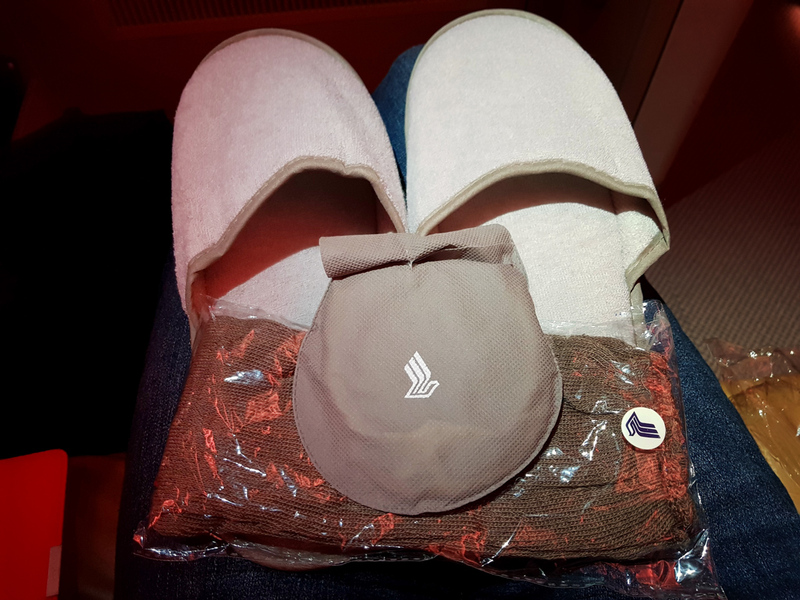 All Business Class passengers also get the standard-issue eye mask, socks and slippers. 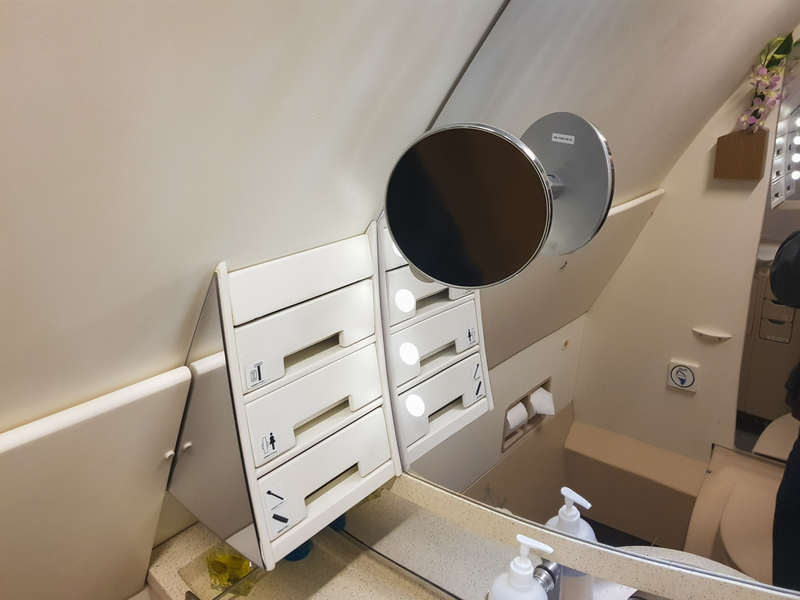 Further amenities can be found in the lavatories, with shaving razors, female sanitary items, dental items and hair combs available for the taking. 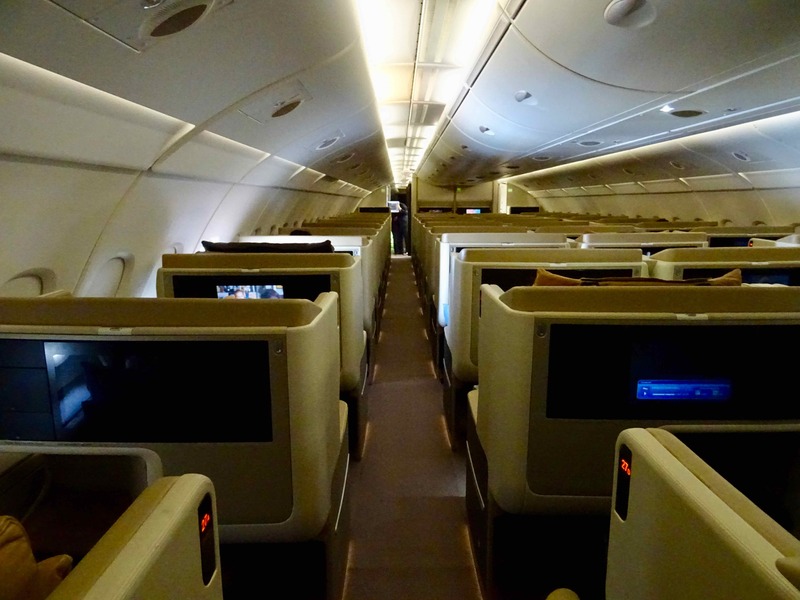 There are two lavatories specifically for Business Class, one at the front and one in-between the cabins. The latter is suitable for disabled passengers, as it is much bigger in size. 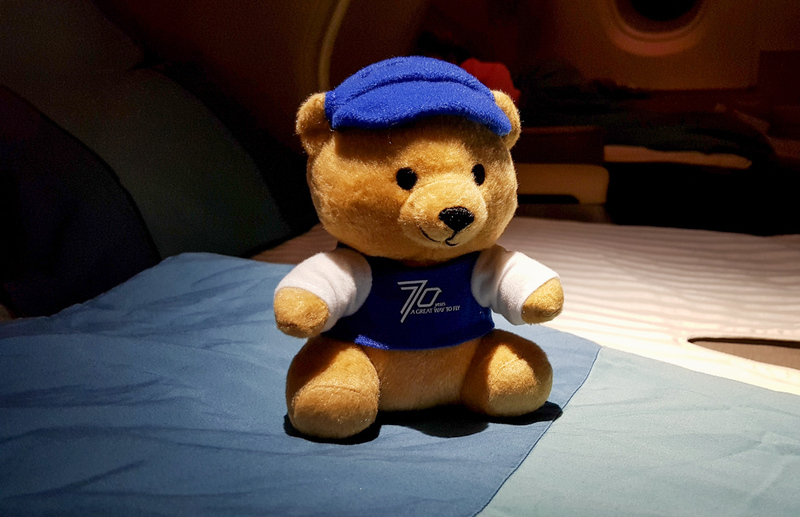 Another perk of flying in premium cabins is the ability to request a Singapore Airlines teddy bear. Usually reserved for kids, they are still quite popular with grown-ups too. 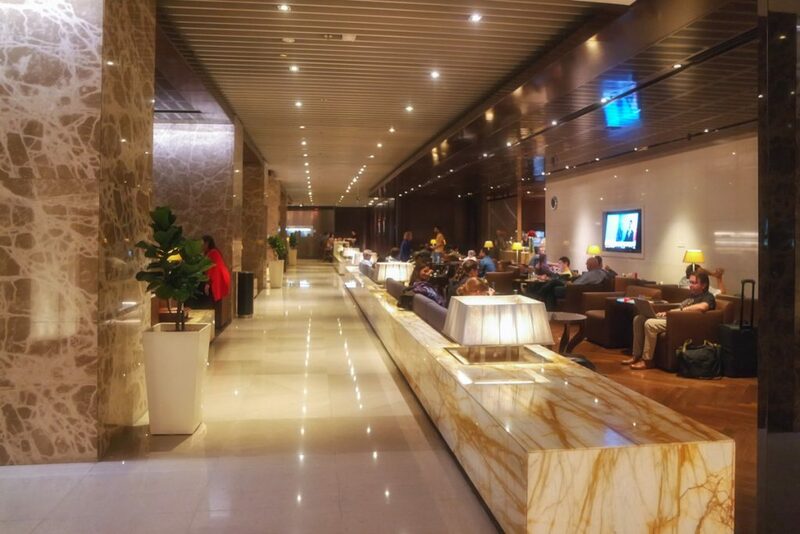 Passengers departing from Sydney or Melbourne will have access to the SilverKris lounges in each city. 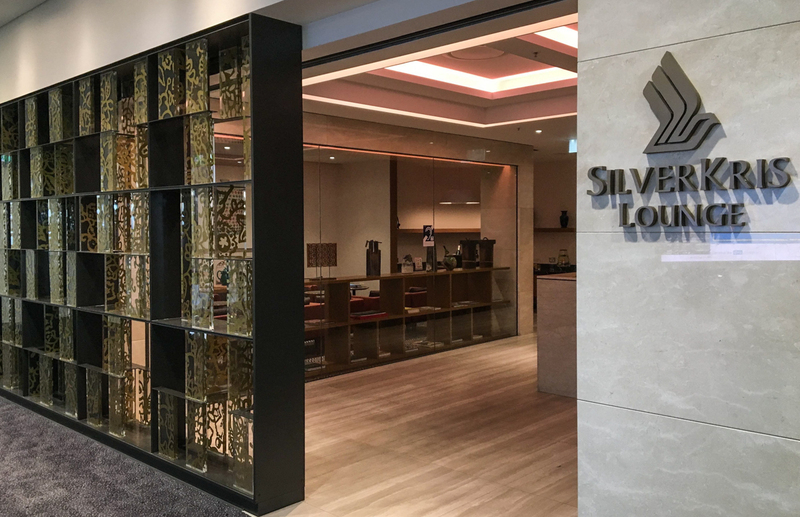 Passengers departing Singapore will have access to the SilverKris lounge in Terminal 3 at Changi Airport. Just note that a security check is performed at each gate, so leave a little extra time than usual in walking from the lounge to boarding. 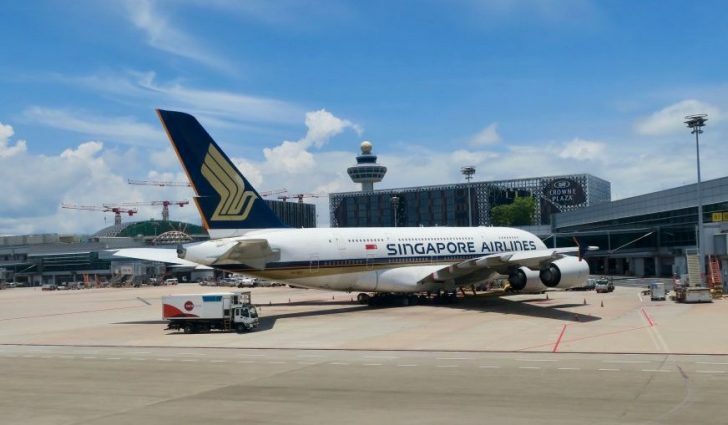 For Australia-based travellers, KrisFlyer miles and Velocity Points are the two major currencies you can use to redeem for Singapore Airlines flights. Taxes are ~$90 through both programs and slightly less on the return trip from Singapore. 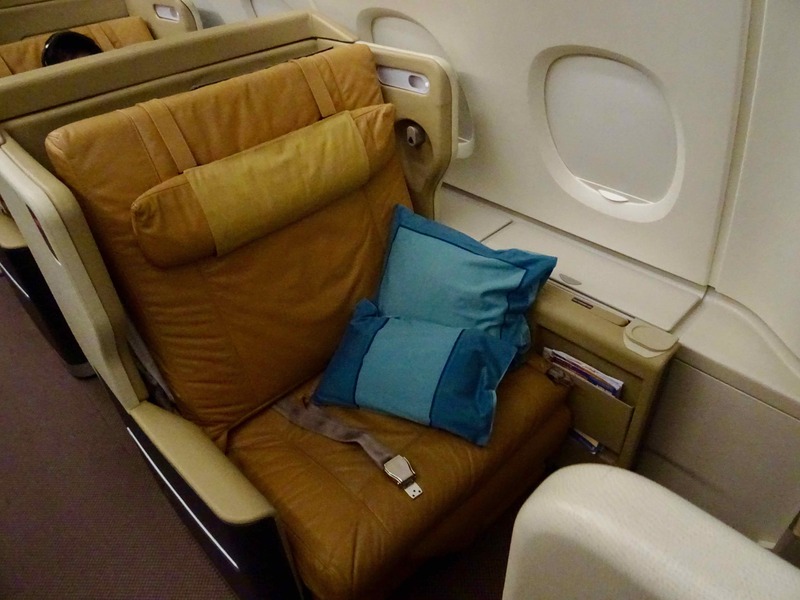 Singapore Airlines gives preference to its own members over partners like Velocity. If the flight you want is only available through KrisFlyer and not Velocity (which sometimes happens), then you can transfer 96,100 Velocity Points to KrisFyer, which you can then use to book through KrisFlyer, but that isn’t a very good use of points. 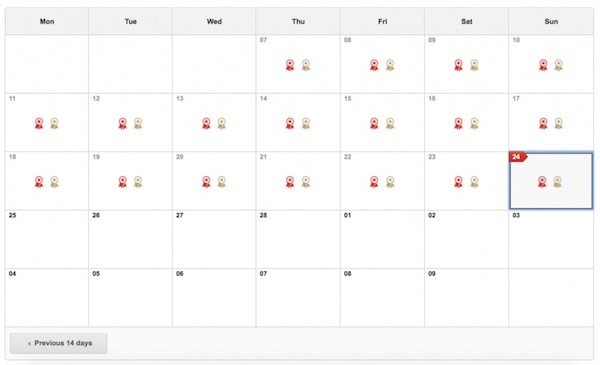 KrisFlyer periodically discounts redemptions on these routes, usually between 30% and 50%. You can also buy Marriott Rewards points and transfer them to either currency. Alternatively, you could set up ExpertFlyer to search for availability periodically and notify you when it finds some (at a cost). 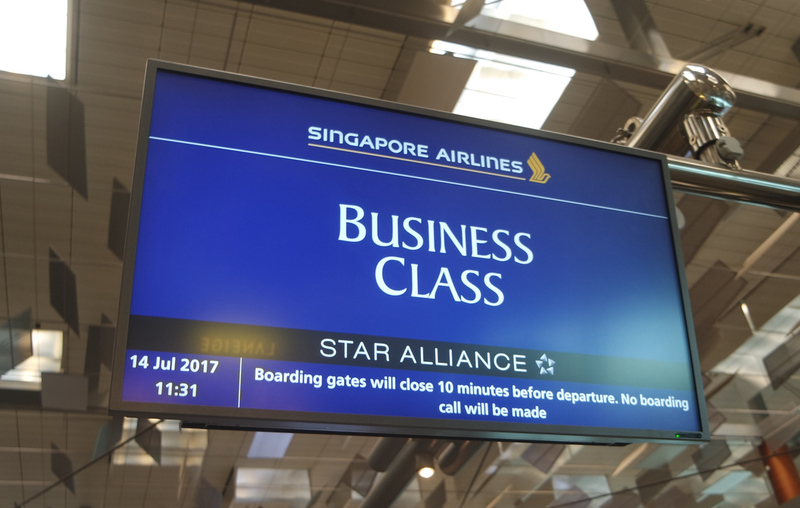 It may be possible to use other Star Alliance airline points, such as United MileagePlus miles, to book, but generally Singapore Airlines does not release much (if any) inventory to its partner airlines for booking (Velocity is the exception). 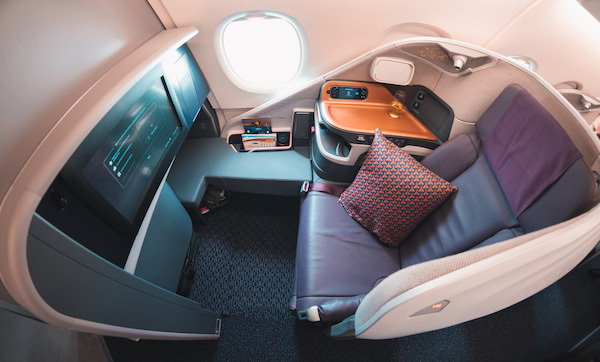 With so many flights a day connecting Sydney and Melbourne to Singapore Airlines’ home base, there is bound to be timing that suits your plans. If you end up booking onto a different plane, i.e. 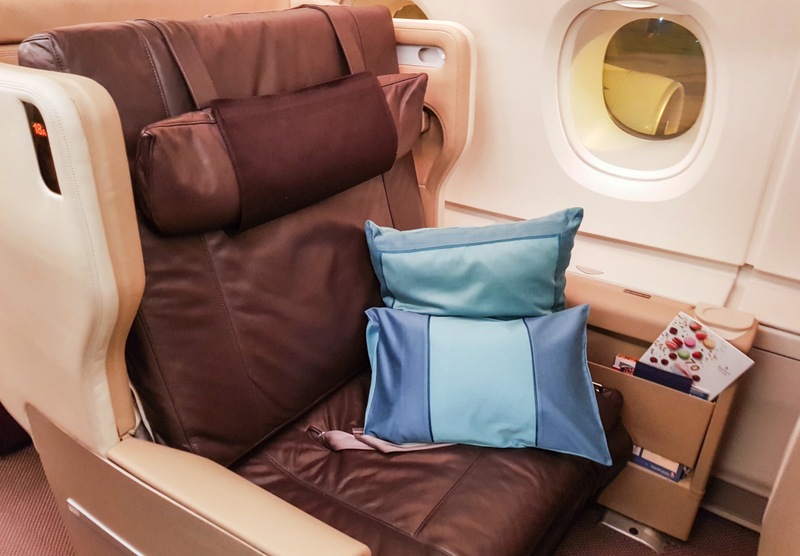 a Boeing 777-300ER or Airbus A350 or A380, then you’ll still get the same experience outlined in this guide, but might have a newer seat with improved features. 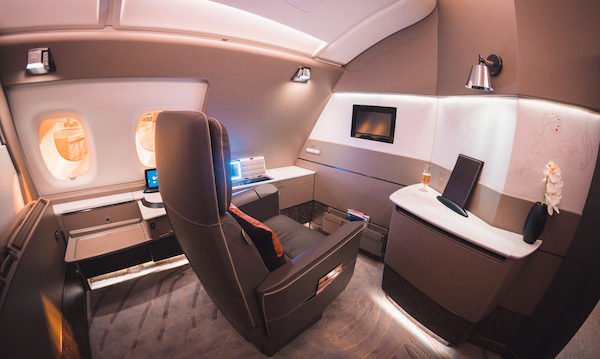 You’ll get a decent lounge and onboard experience, which will only get better when their new and retrofitted A380s start take to the skies with the latest seats from 2018. You may be interested in seeing how this product stacks up against your other options flying to Singapore.